In 1985, Miami Vice star Philip Michael Thomas—always a believer in the power of positive thinking—released an album called Living The Book Of My Life, featuring the song “Just The Way I Planned It.” Four years later, Miami Vice was done, and so, more or less, was Thomas. He made his Broadway debut in 1971, at age 22, and worked steadily on TV and in the movies throughout the ’70s, appearing in the likes of Black Fist, Coonskin, Death Drug, the original Sparkle, and Roots: The Next Generation—whatever was available to handsome young African-American actors at the time. But in the wake of Miami Vice, the man who was once known worldwide as Ricardo “Rico” Tubbs essentially dropped off the show-business radar. He did a few TV guest shots and straight-to-video movies, lent his voice to the Grand Theft Auto: Vice City videogame, and became a spokesperson for a telephone psychic service, until he was replaced by the soon-to-be-infamous “Miss Cleo.” Every so often over the past few decades, Thomas has consented to an interview from his home in Florida, where he’s talked about his music, his children, and how he feels rich—just maybe not so much monetarily. Thomas also rejoined his old Miami Vice co-star Don Johnson twice, as a guest star on Johnson’s hit ’90s cop show Nash Bridges, playing Nash’s retired U.S. Marshall pal Cedrick “Rick” Hawkes. Thomas first appeared as Rick in the April 25, 1997 episode “Wild Card,” late in Nash Bridges’ second season. Early in the episode, Rick comes to see Nash—a special investigator with the San Francisco Police Department—because just when Rick was about to follow through on his lifelong plan to parlay his skill as a poker player into buying a resort hotel, he got cheated. Triad accountant Barry Chen fleeced Rick in a game, then sold the ex-lawman’s $150,000 marker to the Tampa mob. Before Rick even has the chance to explain all this to his old friend, the Nash Bridges soundtrack buzzes briefly with an approximation of Jan Hammer’s Miami Vice theme, and then Nash and Rick embrace warmly, giving fans of Johnson and Thomas’ old show what they’d really tuned in to see. Here, once again, are Tubbs and Sonny Crockett. Johnson didn’t exactly have it easy in the years immediately after Miami Vice either. His movie career didn’t take off the way he’d expected, and he became a frequent tabloid target thanks to his on-again/off-again relationships with the likes of Barbra Streisand and Melanie Griffith. Then Nash Bridges—combined with Johnson’s strong supporting turn in the 1996 golf comedy Tin Cup—eased him into the next phase of his career. He downshifted from international superstar to appealingly low-key screen presence, more in line with a classic Hollywood character actor than a leading man. But while Nash Bridges wasn’t trying to redefine the cop show—at least not to the degree Miami Vice did—it was hardly hacky. On his “Wild Card” commentary track, Johnson says that as executive producer, he insisted on location shooting as much as possible, preferably near waterscapes, so San Francisco and its surroundings could help define the characters. He also wanted the camera to move, even during driving scenes, so the frame would always be a little off-kilter. Nash Bridges was a tightly scripted show, but visually, it celebrated looseness and spontaneity. Beyond its look, “Wild Card” exemplifies Johnson’s preference for surrounding his Nash with “a bunch of crazy characters.” There are two main villains in this episode: the new head of the Triads, Bobby Wu, who draws Nash’s attention when he orders a hit on “Lucky,” one of Chinatown’s most beloved citizens; and Tampa enforcer Charlie Pep, who demands Rick cough up the $150,000 he owes, plus an extra $100,000. Nash is able to get Rick into a high-stakes poker game to win the 150K, but he and the Tampa man differ on whether Rick should pay any “vig.” Meat Loaf plays Charlie Pep, and gives a memorably eccentric performance as he threatens the good guys, using a soft Southern lilt and the threat of his bulk to exert his will. Nash’s icy smirk while staring down the dangerous Pep helps reinforce where the real power is in this town. Similarly, at the start of this episode, Nash and Joe walk right up to Bobby Wu and tell him that because the rules in Chinatown are a little different, they’ll allow him to leave town on his own rather than hauling him in for Lucky’s murder. When Bobby fails to cooperate, Joe tracks down “Tiger,” the actual trigger-man in the Lucky hit. Nash then pressures Tiger into giving up Wu by promising to incarcerate the gangster in an American prison rather than a Chinese one. And in a final coup de grace, Nash works his Hong Kong connections and gets the Triads to take away Wu’s authority. While “Wild Card” wasn’t trying to make any kind of political point about influence-peddling, the way its hero makes deals with the bad guys—and beats up henchmen without even flashing his badge first—reveals a man who seems to believe that people on the right side of the line can make their own rules. Fortune favors the righteous. On the DVD commentary, Johnson erupts with laughter at the “Dave’s not here” line, and warmly recalls how Marin and Chong were riffing together on set that whole week, which was “a lot of fun for everybody.” Johnson clearly has a lot of affection for Marin, whom he personally asked to be in Nash Bridges after they’d gotten along so well shooting Tin Cup. Or perhaps Johnson just sympathized with Marin, as a fellow showbiz survivor. Cheech & Chong were a sensation in the ’70s and ’80s, but Marin had the foresight to disentangle himself from the duo’s drug humor, and has since become a versatile comic actor in movies and on television. Chong, meanwhile, has stuck to playing hippie burnouts in bit parts, in between working as a marijuana advocate (and serving time in prison recently for selling bongs over the internet). As for Thomas, he becomes something of an afterthought down the stretch of “Wild Card.” He’s there mainly to fill out the screen in scenes that try to conjure some of that old Miami Vice magic, as Johnson and Thomas fight side-by-side again, and go chasing after a speedboat in Nash’s yellow 1971 Plymouth Barracuda convertible. This is what happens to some celebrities over the years: They become less valued for their actual talents then for what they represent. For a time, they’re ubiquitous, to the point where the public no longer wants to see their faces grinning from magazine covers and TV screens. Then comes the “Whatever happened to?” phase, at which point the public is more forgiving, and old, once-overexposed stars become marketable again. Except that when they come back, they’re only asked to play one familiar note—catering to nostalgia. That’s what makes the last scene in “Wild Card” so sad. The episode ends with Barry and Rick playing cards—for matches, not even money—then making plans to jet off to Monte Carlo to gamble, so Barry can steer clear of the Tampa folk, and Rick can postpone his hotelier dreams a little longer. The two rounders say their goodbyes and head offscreen, while Nash and Joe wonder if this—Chong and Tubbs—is the strangest partnership that ever was. As they watch their less-successful friends walk away, they chuckle. And we leave them there. 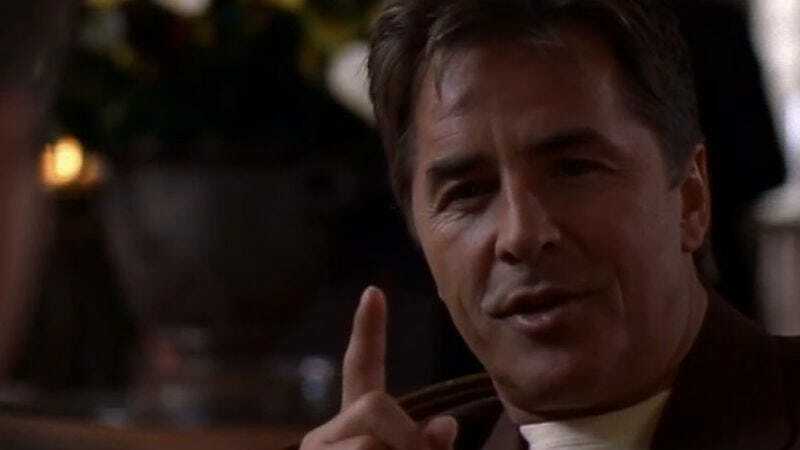 Postscript: Though Nash Bridges is rarely cited as one of the best shows of its era, it left a surprising legacy in terms of the TV writers who cut their teeth breaking stories and writing dialogue for Don Johnson. The day-to-day oversight of Nash Bridges was handled by Carlton Cuse, who got his start in the business writing for the ’80s retro cop show Crime Story, produced by Miami Vice’s Michael Mann. Cuse went on to create the cult Western series The Adventures Of Brisco County, Jr., and went straight from that to Nash Bridges, and over the course of his command of Nash, Cuse would employ Shawn Ryan (who went on to create The Shield and co-create Terriers), Glen Mazzara (a writer on The Shield and now showrunner for The Walking Dead), and Jed Seidel (who worked on Gilmore Girls, Veronica Mars, and Terriers). But Cuse’s most life-changing hire was Damon Lindelof, who came on board for Nash Bridges last season in 2000 and 2001. A few years later, J.J. Abrams asked him to take charge of Lost. An overwhelmed Lindelof called Cuse for help, and the two of them spent six years creating a sprawling, genre-hopping adventure series that grappled with matters of free will, faith, and fate.